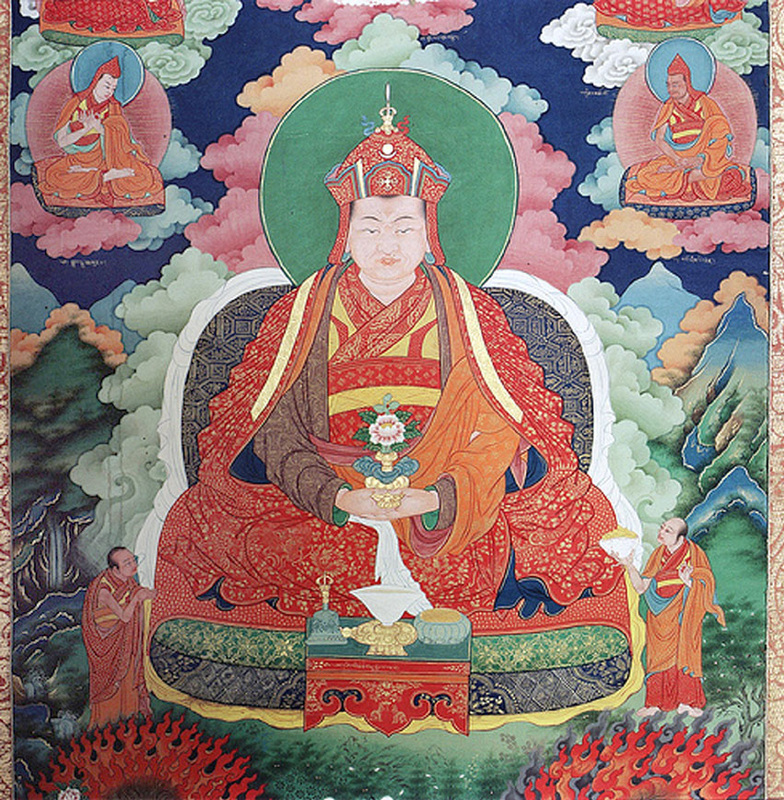 In the 13th century the spiritual master, Phajo Drugom Zhingpo arrived. 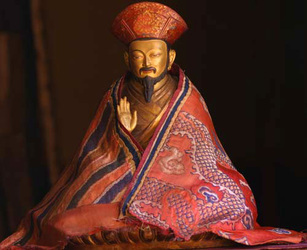 He was the precursor of the Drukpa Kagyu tradition of Mahayana Buddhism which ultimately gained pre-eminence in the country. Many saints and religious figures, over the years, helped shape Bhutan's history and develop its religion of which the Tertons (Treasure discoverers) played an important role who were pre-destined to unearth the ters (relics) hidden for posterity by Guru Rimpoche and other saints. 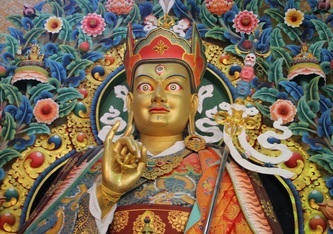 Among the Tertons, Pema Lingpa, born in the Tang valley of Bumthang (central Bhutan), occupies the most important place in the Bhutanese history. His discovery of ters from a lake called Mebartsho (The Burning Lake) in Bumthang is the most famous event. He not only discovered religious texts and arte-facts but also composed dances and created arts which have become one of the most important constituents of the cultural heritage of Bhutan. Mebartsho is also a most visited and famous sites in Bhutan today. With the arrival of Shabdrung Rimpochey (the precious jewel at whose feet one submits) opened the most dynamic era in the history of Bhutan. 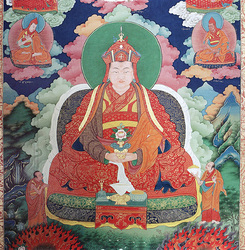 The religious and secular powers were not clearly delineated until the 17 Century when Shabdrung Ngawang Namgyal, the great leader of the Drukpa school of Mahayana Buddhism, established the dual system of government--the temporal and theocratic--with Je Khenpo (chief abbot) as the religious head and the temporal leader known as the Desi. He was not only a great spiritual personality and a statesman but also left his indelible legacy as a great architect and a builder. The Shabdrung constructed numerous Dzongs, monasteries, and religious institutions bringing people from all walks of life under one faith and firmly instituted Drukpa Kagyu as the state religion.The first Dzong that he built, Simtokha Dzong in 1627, stands majestically as one of the sentinels of the Bhutanese identity, a few miles away from present day Thimphu. 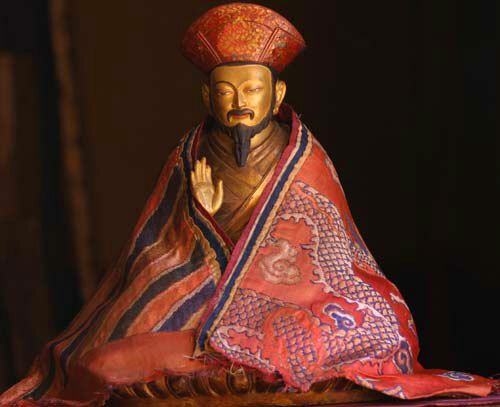 The Shabdrung's dual system of government, ruled by 54 Desis and 60 Je Khenpos, steered Bhutan from 1651 until the birth of the Wangchuck dynasty and establishment of hereditary Monarchy in 1907. The earliest notable relics visible of the history of Bhutan, today, are the two monasteries, the Kyichu Lhakhang in Paro and Jambay Lhakhang in Bumthang which were built in the 7th Century A.D. Little is known about Bhutan of that period. At the end of 19th century, the Trongsa Penlop, Ugyen Wangchuck, who then controlled the central and eastern regions, overcame all his rivals and united the nation once again. He was unanimously accepted as the first hereditary monarch of Bhutan in 1907. Thus the first king was crowned and the Wangchuck dynasty began. Over the following four decades, he and his heir, King Jigme Wangchuck, brought the entire country under the monarchy's direct control. Upon independence in 1947, India recognized Bhutan as a sovereign country.